I’m not going to tell anyone how to eat, unless they ask my advice, of course. But I finally told myself and am following my own advice. I got to the point where my aching joints, delayed bowel movements, frequent gas and dry skin just got to be too much for me. So I eliminated sugar, gluten, legumes and most grains from my diet a week ago. I know those are the foods I’ve struggled to digest in the past. And wow, do I feel better. The joint inflammation and pain is almost totally gone. My bowel movements are softening and totally unexpectedly I feel warm, even when it was 57 deg in my home. I’m excited and inspired. Have been browsing some paleo blogs for recipes and checking out the Gaps diet for extra ideas such as drinking bone broth with my meals. On some intellectual, moral, spiritual and environmental levels I think being vegetarian would be better. But my gut doesn’t seem to think so at all and that’s who I’ll be living with for the rest of this life. 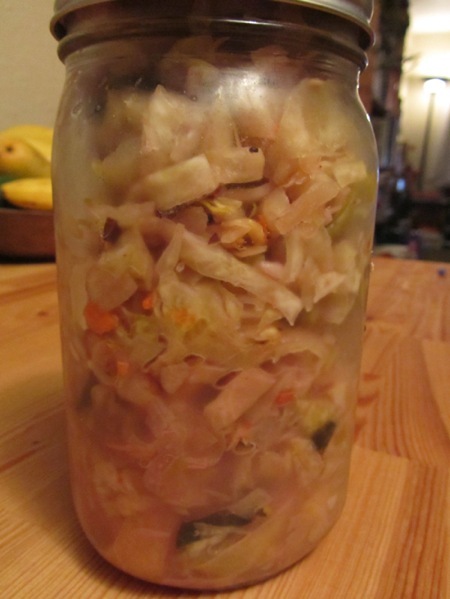 Good thing I’ve been on a roll with fermenting foods recently, because I’m supposed to eat a little with every meal and have almost made it through a gallon of kraut. I had this brief argument with myself with regards to posting about my digestion. Shouldn’t I be all the way well if I am healing others? But then I realized how ludicrous that is. We are all ongoing works in progress and I bet there are others out there who are struggling with similar issues. As long as I am one step ahead of someone in the healing process I believe I have something worthwhile to share. Thanks to my amazing medical intuit Dr. Sadie Rutter for helping me learn to listen to my gut and feed it what it likes.